Do you know someone who is an exemplar in public service? Someone who you think is worthy to be called Lingkod Bayani? 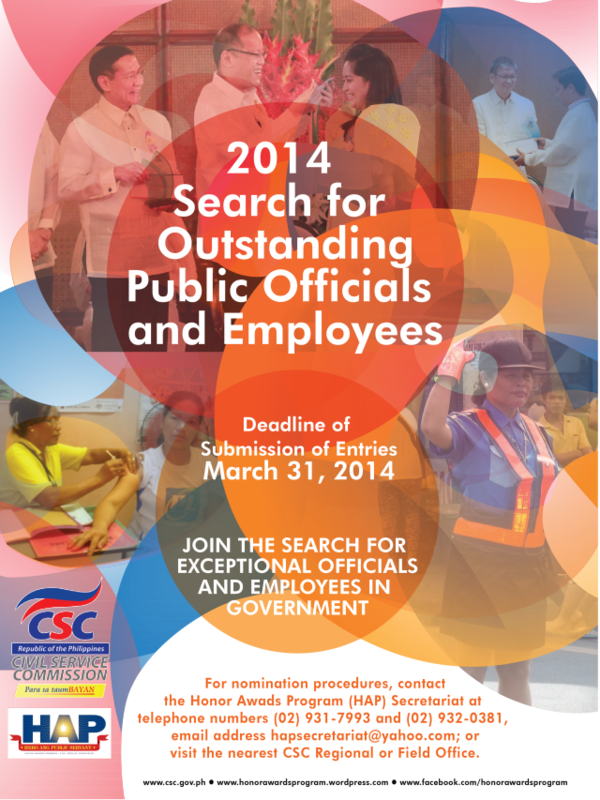 Now is the time to help that person be recognized because the 2014 Search for Outstanding Public Officials and Employees is now open. This rewards and recognition program of the Civil Service Commission (CSC) aims to hail the servant heroes of our country as well as inspire all other civil servants to perform excellently in their respective government agencies. CSC usually holds this event at the Malacañan Palace in the last quarter of the year. The Search covers three (3) award categories, namely: the Presidential Lingkod Bayan Award, the Dangal ng Bayan Award, and the Civil Service Commission Pagasa Award. The Guidelines for the 2014 Search is now available for viewing and/or download from the CSC website (http://excell.csc.gov.ph/cscweb/mc.html). For inquiries, you may call our Public Assistance and Liaison Division‘s hotline at (052)482-0699, or you may send us an email through cscregion5pald@yahoo.com.